The house once owned by the Man in Black is back! 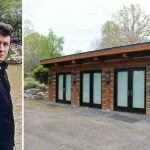 We first took a peekat the lakeside pad of Johnny Cash and June Carter Cash when it officially hit the market in 2017. Since then, the historic home has attracted plenty of buzz, but no serious buyers.